Say goodbye to tattoo regret with laser tattoo removal! If you have an unwanted tattoo or are simply looking to “clean up your canvas” for a more elaborate one, you’ve come to the right place! Laser tattoo removal is a proven, effective, long-term solution for eliminating tattoo ink. And, our laser treats all colors! Laser energy is gently applied to the skin over the tattooed area. The laser shatters each ink particle into much smaller particles that can be eliminated through your body’s natural process. Through a series of treatments, the tattoo will fade and ultimately disappear. You may notice an immediate fading. Generally tattoo removal will take place in a series of treatments. The number of treatments depends on the color and density of the ink, the age of the tattoo, along with the location on your body. Treatment plans can be adjusted to fit everyone’s lifestyle – schedule a consultation today and we can review your goals and expectations. 20cm and above price on request. Will the tattoo disappear right away? Patients have reported the sensation as comparable to getting a tattoo, but the removal treatment is much faster! For improved comfort, a chiller or cold-roller may be used over the treated area. Is there downtime following a laser tattoo removal treatment? Generally, there is no downtime at all. Often, a protective bandage is placed over the laser-treated area and you can continue on with your normal activities. Are you able to treat all tattoo colors? Yes! Our laser is specialized to treat the full color spectrum including white and black. Some colors are more difficult to treat and may require more sessions. The overall cost will depend on the number of treatments required. That number depends on numerous factors including ink color, density and composition, location on the body, and age of the tattoo. Can I remove only part of a tattoo? Yes. We can customize treatments to fade tattoos to help prep for tattoo cover-ups, and we can remove parts of a tattoo. If I’ve already had a laser treatment somewhere else, can I have my tattoo treated by your laser? Yes. 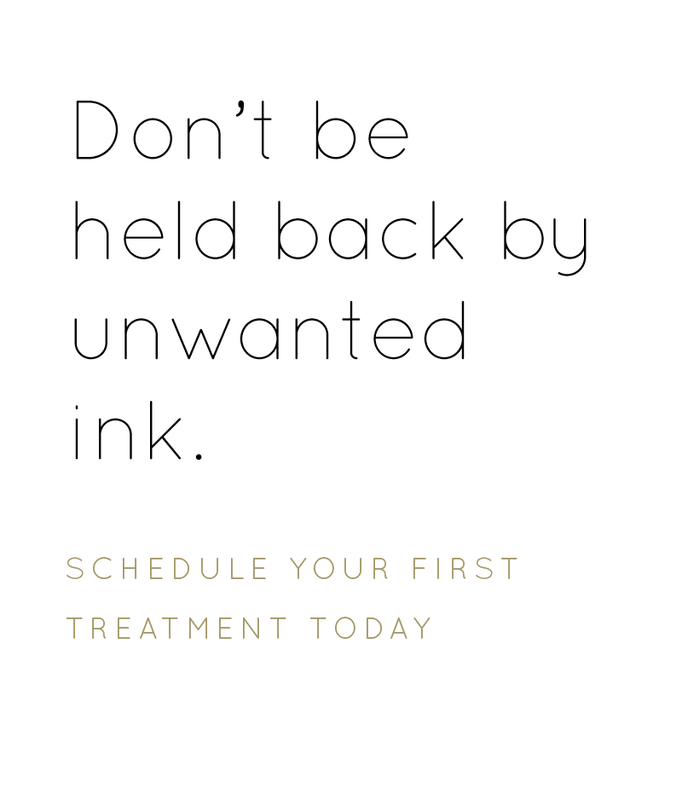 But, it’s important that we have a consultation to evaluate your tattoo, the level of fading, and plan a course of treatments. Have you had permanent makeup and it wasn’t what you expected? We offer two methods of removal, non-laser and laser. The non-laser solution is applied with a tattoo machine similar to when permanent makeup was preformed. This method is more suited to removal of lip line or tiny areas like the odd hairstroke. Laser is the most used method of tattoo removal, mostly used on the brows.